Japan’s deceptive and dishonorable tactics to cover up their whaling activities have failed. Their lies to the world are transparent, and in the long run will harm them more than they realize at a time when they need the world to see them in a positive light. Now again when we think of Japan, we only can see the cove, red with the blood of innocents. On May 4th a pod of approximately 75 beautiful, intelligent pilot whales were driven into the blood cove in Taiji Japan. The whales watched and waited, for many hours as the Japanese hung the blue tarp they hide behind when they do their killing. You could see the pilot whales in the netted enclosures nervously bobbing up and down. They knew the worst was yet to happen. Hours passed and eventually the killing began. The Japanese Fisherman led the adults under the tarps and then descended upon them with their crude knives and hooks. The red blood filled the cove. The pilot whales fought for their lives with all they had. They thrashed, and threw themselves onto the rocks, but the Japanese Fisherman are well trained torturers of cetaceans. The women and children listened, and tried to look under the tarps as the matriarch, their parents, and the rest of their adult community were slowly and brutally murdered over a two day period. Many of the victims were dragged alive, with their spinal cords severed, all the way to the slaughter house, where the final end would come. For the next two days the remaining victims would swim in the red blood of their families without food, getting weaker and weaker, knowing that the future only held death for their pod. This year the dolphin molesters of Taiji, and the Japanese government did their best to throw off activists with a media propaganda blitz. On February 16, 2011, the Japanese cancelled their Antarctica campaign thanks to the Sea Shepherds who literally chased the Japanese out of the Antarctic. On February 26, 2011 Brian Barnes from Save Japan Dolphins confirmed the tarps had come down in the blood cove. It seemed the season had ended. On March 11, 2011 the tsunami stuck Japan. The Sea Shepherds Crew had just arrived in Otsuchi to document the horrific Dall’s porpoise hunt that takes place every year. They watched from a hill as the entire city was devastated. In the days that followed Japan reached out to the world for help and the world responded with compassion. The tragedy that unfolded was beyond our imaginations. Many of us reached with donations, and words of love and encouragement. We hoped that the Japanese would finally listen to the world and stop killing cetaceans. How very wrong we were. There would be no compassion for whales and dolphins from the Japanese. On May 2, 2011 the Wakayama government issued a permit to brutally murder 200 innocent pilot whales in the blood cove. On May 4, 2011 the news from the cove was immediate. Thanks to Brian Barnes of Save Japan Dolphins, and the Sea Shepherds Cove Guardian headed by Scott West the ugly and dark secrets of Taiji’s blood cove would be again seen by the world. As the horror unfolded dolphin and whale supporters networked worldwide. As the Japanese dolphin molesters led an entire community to their death we blogged and networked like never before. The internet buzzed with action. Petitions were signed, emails sent, and phone calls to the embassies made. When I personally called the Japanese Embassy in San Francisco the young man I spoke with said, “If you think calling the embassies is going to help save those pilot whales you are mistaken. You are wasting your time”. I let him know that we would continue calling until we did make a difference!! Interestingly, in the midst of the murders in the blood cove a fellow dolphin supporter shared and article from the travel site “Inside Japan”. The article posted was, “Taiji coastal whaling season cancelled”. Was this article just written by chance in hopes that tourists with objections to the yearly dolphin massacre that takes the lives of 1000’s, would spoil their tourist season. Did this travel agency want to hide the truth? Or did the Japanese government release this to throw off activists? Let “Inside Japan” know that when their post went out a genocide of pilot whales was taking place! Let them know your travel dollars won’t be going to Japan until the killing stops. Eventually the dolphin molesters opened the nets for some of the juveniles, or rather children. The poor babies just stayed huddled in a corner of the net, swimming in the water red with the blood of their families, anxiously looking towards the tarps for a glimpse of their mother or father. The Japanese attempted to drive them out to sea using their banger boats late in the afternoon. Their survival is not probable as they were all babies. The Matriarch that led them was dead, their parent were dead. They are now alone in a sea without their families who provided them with food, guidance, directions, all the things we need as humans. 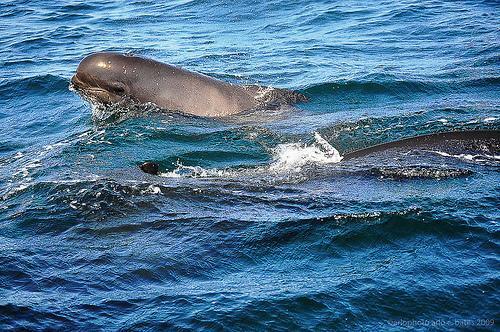 The pilot whale children stay with their parents for their entire lives. They are at the same growth rate as humans. How could the Japanese dolphin molesters expect them expect to make it? We will never know if the nets were opened in response to all of our calls but because there might be a chance we need to call again and again, and yes, again. Here is a list of Japanese Embassies. Please start calling the embassy closest to you Monday morning at 9am. A phone call is nothing compared to the horror we witnessed this week. Please Support the Sea Shepherds, The Cove Guardians, Save Japan Dolphins, and Wdsf/Prowal. These groups are making a difference and if we take action we too can make things happen by joining our voices and letting the 26 dolphin molesters, and the 30 “research” whale molesters know the world has had enough of their tradition!! It is time for the senseless killing to stop. It is time for the cove to be a place of peace, not death. This entry was posted in Cetaceans, Dolphins and tagged dolphin drive, Japan, people of taiji, pilot whales, taiji, travel to japan by Kirsten Massebeau. Bookmark the permalink. but could not finish it sorry it´s just so sad, besides making friends know about this, what else can we do from here? were can one make a donation to one of the organizations that fight against this killings? Hi Ana, there is a lot you can do! Make phone calls, send emails, sign petitions, networks with others. Join us on Facebook! Just friend me, Kirsten Massebeau. I donated all the funds I would have normally given in the disaster of the Tsunami to Rick Barry and his fund, and hope that his organization will be able to make a difference. Thanks so much for your comment Axel. The news for dolphins and whales in Japan hasn’t been good. The only way the Japanese will ever stop eating whale and dolphin meat will be because of the high levels of mercury and other toxins in the meat. For some reason they cannot seem to grasp the intelligence and sensitivity of cetaceans. They are a part of our oceans and have a right to live without fear of man. We as activists need to continue as voices for the dolphins that are being slaughtered and Japan and are held in captivity all over the world. I applaud you passion for saving whales and dolphins Axel, I share that with you. I don’t think the tsunami was karma though. It is not all Japanese people killing whales and dolphins. In fact, there are only 26 fisherman in Taiji that kill 25,000 dolphins a year. The research whaling fleet is also run by a handful of men. I can’t tell you why the Japanese don’t rise up and stop the dolphin drives and whale hunts. The public out cry shames Japan. They are a people of honor. The honorable thing to do is accept the science of dolphin and whale intelligence, and end cetaceans killing and captivity. We must convince them to do that! I like this post! You really lay out the time line well!! I have a feeling things will be changing in Japan. How said that so few create so much shame for Japan. I Hope that people interested in traveling to Japan read your post. I am sure they will be very interested in the activities going on in Kushiro, Hokkaido and Taiji.